If you had the power to make seismic positive changes to the world, would you do it? How far would you go? At what point do you step back and let people take control of their own destiny again? These are the questions plaguing Meru, the central character of Matt Kindt’s Dark Horse ongoing series MIND MGMT, which ends with this week’s NEW MGMT one-shot. The story of the last 35 issues largely dealt with Meru learning her place in the history of MIND MGMT—a secret government agency that trained people with psychic abilities to act as spies and create mind-altering propaganda—and coming to terms with her immense power as she went to war with The Eraser, a former MIND MGMT agent who wanted to rebuild the organization to suit her own nefarious agenda. This conflict built to a cataclysmic showdown in last month’s MIND MGMT #35, and now that the battle is done and The Eraser is defeated (or is she? ), Meru has to figure out how to make MIND MGMT and its agents a beneficial force for the future. MIND MGMT was consistently one of the most complex comics on stands, threading multiple stories together into an expansive pulp narrative where every little piece of information ultimately played a valuable role. 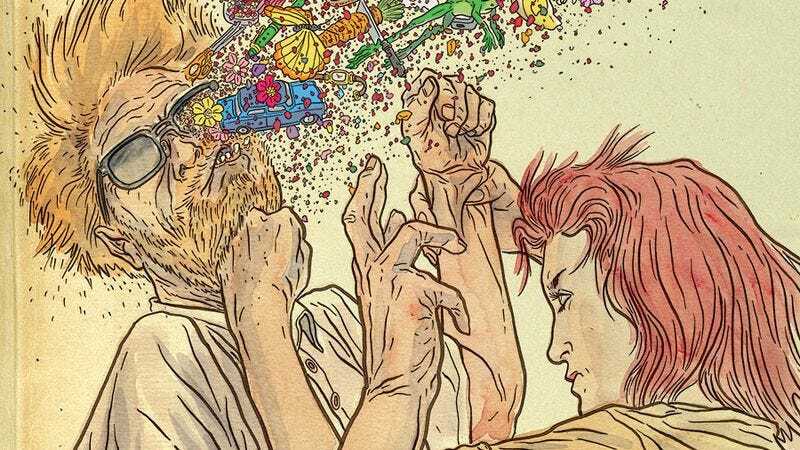 The plotting was as intricate as the painted artwork, and Kindt clearly had an endgame in mind because everything fit together to deliver a satisfying conclusion to the main Meru-versus-The Eraser storyline. For the series’ epilogue, Kindt pulls away from the action/espionage elements and brings the focus back down to the characters, wrapping up their individual arcs in a way that shows how Meru’s NEW MGMT differs in structure from MIND MGMT. Before diving into the character relationships, Kindt establishes the new perspective of Meru’s agency, one that recognizes the limits of power. “The world isn’t a better place,” Meru narrates at the start of the issue. “It’s not worse. It just is. People will do what they’re going to do. All we can do… is do our part. Wherever we are.” It’s impossible to fix everything because it’s impossible to please everyone, and trying to fix everything invites corruption as the fixers gain more and more influence. Meru wants to put her and her friends’ extraordinary abilities to good use and help the people that need it, but it’s a tough tightrope to walk, particularly when those abilities involve psychic manipulation of unknowing subjects. Meru’s narration at the beginning is accompanied by three different scenarios that are dissolved by the work of NEW MGMT agents: a pair of gunmen in Paris surrender after seeing peaceful graffiti; violent Nigerian rebels become passive after eating fruit that conjures happy emotions; and refugees are given free passage into Turkey after the guards read a book (Llama Land) that inspires them to open their borders. These three situations can be seen as metaphors for the power of pacifist art and humanitarian aid, and while it’s unlikely that a children’s book or a crate of oranges would stop one of these conflicts in real life, generating art that promotes peace and understanding and providing much-needed resources to under-served areas can lead to lasting changes. This is the kind of work Meru’s NEW MGMT does, and it does it without a centralized hub. In the end, NEW MGMT is about the value of a two-person relationship. Rather than having one large organization, this new incarnation of the agency is made up of isolated cells that are autonomous in their respective cities, and the success of Meru’s operation rests in the strength of these pairings. Throughout the series, Kindt has used the side page borders to incorporate text that alters the context of the main content on that page, and in this issue, Meru’s NEW MGMT Field Guide brings extra weight to each relationship resolution. The first line from the Field Guide appears on page 4, detailing the basic idea behind the two-person structure as agents Big Jim and Tana head to a career placement center in Berlin. Choosing this pair to start is a clever way of visualizing the balance that comes with this new arrangement, putting the tallest and shortest agents together to represent two extremes coming together as a unit. The next scene shows a solo agent riding a train and sharing psychically charged music that brings tears to the eyes of his fellow passenger, but his positive action is undercut by the accompanying Field Guide entry that strictly states that lone agents will only be tolerated in the short term and that they should always be on the lookout for their companions. The text is at odds with the main action, and reinforces the importance of the paired structure, even when an individual is helping others. From this point, Kindt begins to zero in on the main characters, checking in with the budding romance of Perrier and Duncan in Paris before landing in Zanzibar to put a button on the central relationship between Meru and Henry Lyme, the MIND MGMT agent that rescued her as a child. The Field Guide’s warnings about the compromised physical and mental health of solo agents create an atmosphere of dreadful tension as Kindt shows Lyme walking alone through the streets of Zanzibar, making his way to a café where he uses his psychic abilities to have a conversation with exact mental facsimiles of his late wife and daughter. Henry falls into one of the dangerous thought traps that Meru mentions in the Field Guide, but he knows the way out. His wife and daughter tell him what they always tell him, that they love him and that he needs to let them go, and he finally succumbs to their request, releasing the spirits that have been haunting him for decades. His moment of liberation is downplayed by the composition of the splash page showing Henry alone in the café, sitting sullen across from two now-empty chairs; it’s an image that projects an intense, lonely sadness, with the emptiness of the room reflecting the emptiness in Henry’s heart. Kindt’s watercolors bleed out past the light blue page border to reinforce how overwhelming these emotions are, radiating outward with a force that cannot be contained. Henry isn’t alone, though. He has Meru as his NEW MGMT companion, and the familial bond they’ve created over time is what gives Henry strength during this vulnerable time. Henry saved Meru when she was a young girl stranded in the chaotic streets of Zanzibar, and Meru saves Henry in the present by being there for him as he goes through a painful transition. The emotional bond between the characters comes through in the small, quiet moments they share, and it’s easy to read the heavy unspoken subtext in their interactions. In general, this is an issue of small, quiet moments—the only flash of action is one panel showing Meru and Henry as fantasy warriors—and it’s a welcome change of pace after such an ambitious, turbulent three-year journey. It’s a reminder that even with all these captivating high-concept elements, the most important thing for Kindt is the characters. Meru has gone from an intrepid true-crime writer to the leader of a covert agency of benevolent psychics, and while her story may end here, her mission does not. NEW MGMT isn’t an especially experimental issue, but the book is still innovative in how it wraps up story threads while planting seeds for a future narrative that will only exist in the reader’s imagination. As Meru’s narration lists the multiple benefits of two-person teams, Kindt shows various pairs of agents throughout the world, creating new, never-to-be-seen stories that keep the world alive after the series ends. The new agency rules give the character relationships greater importance, but they also set up the internal challenges NEW MGMT will face moving forward into a purely hypothetical future. Then there’s the final twist: The physical comic is actually the NEW MGMT Field Guide, making the reader the final recruit in Meru’s ongoing campaign. One of the major themes of this series is the power of art to influence individuals and society, and Kindt ends the title with a call to action because the fight never ends. Everyone has the potential to help in their own way, and even if that power can’t be used to change the world, maybe it can change the life of another person for the better.